All that Glitters is not gold.....sometimes it's PINK!!! I started with a Spellbinders Captivating Squares die cut, which I doused with this beautiful Martha Stewart Glitter in Tourmaline....let me just say this color will come in super handy for making Christmas Ornaments for our little Penny-Poo! :) I added a Swiss Dots textured panel to the Spellbinders die cut, which makes for a lovely resting space for my glitter butterfly! My butterfly is by Cheerylynn, Small Lace Butterfly. I die cut the pretty image in White card stock and the backing from Adhesive Paper. In this way I was able to layer the 2 pieces together and then sprinkle and burnish in my pretty glitters, I used; Amethyst, Kunzite and more of the Tourmaline. The Adhesive Paper really holds onto the glitter....yay! I also popped up the butterfly for added dimension. Sentiment stamped on a Vellum strip in Rose Red, and then Heat Embossed with Clear Powder, this helps with the smearing issue. PTI, Happy For You stamp set. Adhesive pearls and a little Heart Button for accents. Stunning card Donna, lots of glittery goodness and your butterfly almost looks like a shaker with all the pretty glitter under it! Don't you just love the adhesive papers, they make it so easy to add glitter and have it 'stick'..another stunner my friend! Gorgeous and glittery, Donna! I love the background and all of the layers you have created too. That tourmaline color is fabulous! WOW! Look at all that gorgeous sparkle! Love the butterfly and dimension! GORGEOUS! What a wonderful design. Love the glitter die cut and the fabulous butterfly. Just darling. Yowza!!!!! I have been looking at this on the DD blog for weeks and couldn't wait to comment. Those colors are gorgeous, I thought you had used glitter paper. 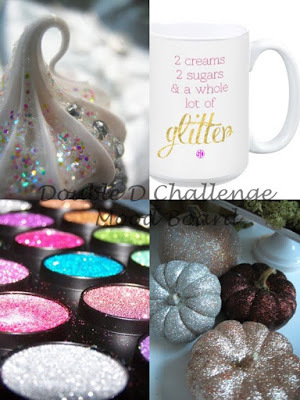 The idea of using loose glitter is mind boggling. This is beyond beautiful with that butterfly and the square die cut. Just simply fabulous!!! What a fabulous, beautiful card Donna! Just love the butterfly with all the glitter. I knew that I was behind, but How could I have missed this one. Just stunning and I love all of the glitter. A butterfly should be all glittery.